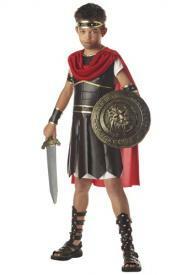 My Family Fun - Child Hercules Costume The Greek hero Hercules Costume for kid! The Greek hero Hercules Costume for kid! Get the strength of the gods in this Child Hercules Costume. Add Roman-style sandals, a sword and shield, and perhaps a helmet, and you'll be ready to perform great feats of strength and daring!